Typed carbon copy letter. Colgate W. Darden, Jr. to J. C. Smiddy. 1958 February 20. Clinch Valley College always had a ready supporter in University of Virginia President Colgate W. Darden who escaped his Charlottesville office as often as he could to travel there, donning old clothes to putter around the construction sites and promising Dean Joe Smiddy that he would obtain help from his in-laws "in the paint business" (the duPont family). 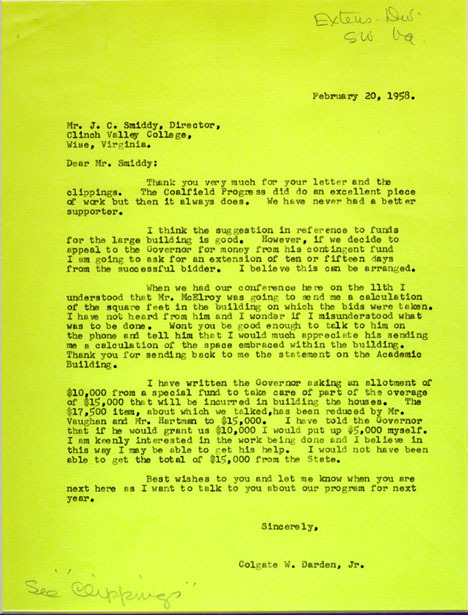 In 1958 several hundred "voters and tax payers" in the Clinch Valley area telegraphed Darden asking his support for additional funding in the General Assembly. Smiddy then sent him an estimate of costs for an academic building, suggesting that the funds for the construction be sought from the Governor's Contingency Fund with furnishings provided locally. Darden replied to Smiddy that he would personally fund one-third of the cost of a $15,000 overage if the Governor would grant the other two-thirds.